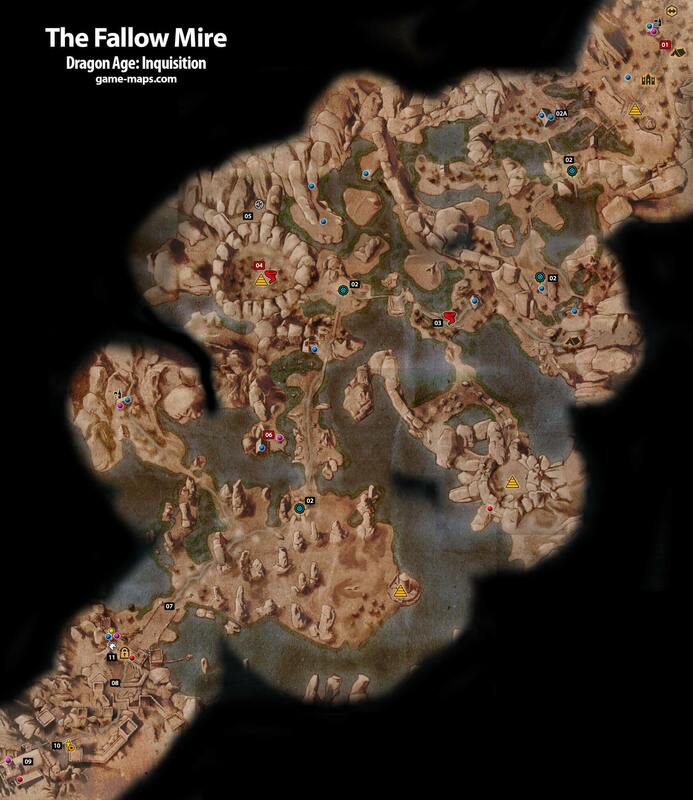 The Fallow Mire - Dragon Age: Inquisition Walkthrough, Game Guide and Maps, with Quest and Locations of Camps, Merchants, Rifts, Ocularums, Astrarium, Dungeon Entrences, Landmark (POIs), Crafting Station, Mosaic Piece, Inquisition Agent, Secrets, Party Members, Bottle of Thedas and Codex Entry. I SPENT THE LAST WEEK IN THE FALLOW MIRE. THE BOG STRETCHES FOREVER, AND ITs SLOW RIDING AT NIGHT WHEN THE MISTS GET THICK. YOU CAN STILL TRAVEL ALONG THE OLD ROADS, AND THERES ENOUGH GOOD HUNTING TO MAKE THE TRIP WORTHWHILE. FISH, BIRDS, EVEN A FEW HARTS. THERES ONE THING To LOOk OUT FOR, THOUGH. WHEN ANYTHING DIES IN THE WATER, THE MIRE PRESERVES IT. I WAS STALKING A MAGNIFICENT BUCK WHEN A CORPSE CLAWED OUT OF THE WATER AT ME. IM NOT AFRAID TO SAY I RAN. NO RACK OF ANTLERS IS WORTH FIGHTING A DEMON. MY COUSIN IN FISHERS END THOUGHT IT WAS FUNNY. SAYS HE HAS TO LOOK OUT FOR UNDEAD EVERY TIME HE GOES OUTSIDE THE VILLAGE! | DON'T KNOW HOW HE STANDS IT. Mysterious Veilfire Runes. Light torch and read rune. "U can open that house by destroying boxes. Thy blocking doors inside 2 codex entry." NPC: Apostate Widris You have to kill him, he will summon demons. Enter Castle, kill Avvar defender. There is switch upstairs the gate to close outer gate and open inner. NPC: Hand of Korth Kill Avvar Leader and his followers. ITEM: Rusted Key - after killing Korth in loot, opens locked doors to Inquisition Hostages and free them. ITEM: Grey Warden Banner Use Search to find secret. After killing Hand of Korth you can join Avvars to Inquisition. ITEM: Grey Warden Tome - Use Search to find secret.